Suppositional necessity is the farce that exposes the Thomist's justification for god's necessity. You see, in trying to prove god necessarily exists, the Thomist will act as if the specific god he believes in is logically necessary—as if logic demands the Thomist's god must exist. He will hope this is enough to convince you of his conclusion. But when you point out the fact that because his god is equal to his will (ie, god's will is his essence), and that god's will to create our specific universe isn't logically necessary, the Thomist is really saying that a god with an unnecessary nature or essence is a necessary being, which is a contradiction. So to clarify that, he explains that what he really means by "necessary" is that god is suppositionally necessary, meaning, god wills unnecessary things and because what god wills could not have been any other way, it is "necessary" after the fact. The Thomist concludes that god's will exists "freely" because he believes (a) no outside forces of any kind can affect god, and (b) it isn't logically necessary. But of course, nothing can be further from the truth. 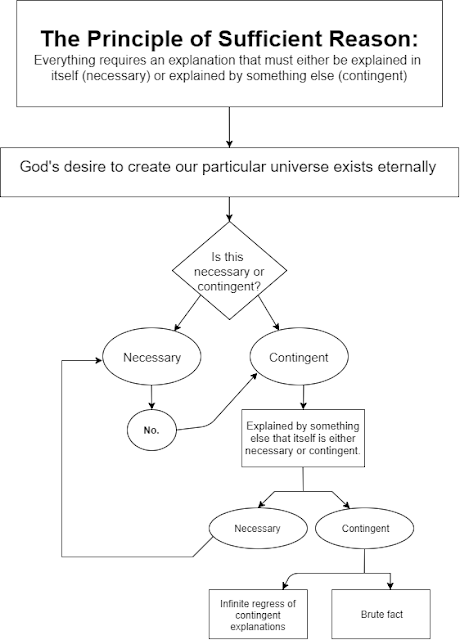 If something can be "necessary" because it's eternal and therefore could not have been otherwise even though it's not logically necessary, then the same thing could be true of an eternal universe: it isn't logically necessary, but because it exists and is eternal, it cannot be any other way. I will demonstrate this further in part 4. This is working backwards, starting from false premises like the principle of sufficient reason, and then narrowing down possibilities and merely attributing free will. 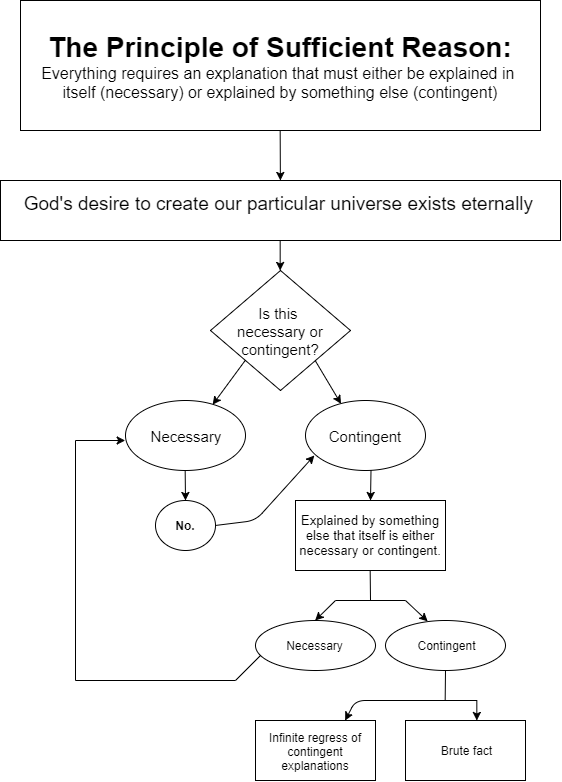 Claiming god created this specific unnecessary universe out of free will also doesn't avoid the inherent objection: that god's will must have an explanation according to the principle of sufficient reason, especially since god's will is his essence, which is existence. The explanation for god's unnecessary "free" will to create our universe requires an explanation, according to the Thomist's own principle of sufficient reason. To say that it doesn't is to say that an ontological claim doesn't need explanation. The Thomist could claim there's an explanation, but that we just can't know. It's an epistemic brute fact, he can claim. Some theists will say I'm confusing epistemic brute facts from ontological brute facts. But I'm doing no such thing. The problem is not merely that we can't find the exact reason why god would want to create this particular universe as an unnecessary lesser good, it's that since it isn't necessary, no necessary explanation is possible as an option. And that means any explanation that could possibly exist will be one that is not self contained: it will have to refer to something else to explain it. That is exactly what gets you into the dilemma I argued over a year ago on Strange Notions. I challenge anyone to show where this logical flow chart is incorrect. Any response involving suppositional necessity is a non-starter. And that wraps up part 3. Some of this is indeed a bit redundant, but it's necessary for me to stress the point. When closely examined, you can see that for all the sophistication on Strange Notions, the arguments there implode under scrutiny. Dr Bonnette simply has no case for god's necessity that an atheist can't also use (a point I will justify even further in part 4) because what he really means by "necessary" is suppositional necessity, nor does he have a case for god's supposed free will. To claim a will is free that could not have been different negates one of the most common requirements of libertarian free will: the ability to have done otherwise. I will follow up with the refutation for part 4 shortly.